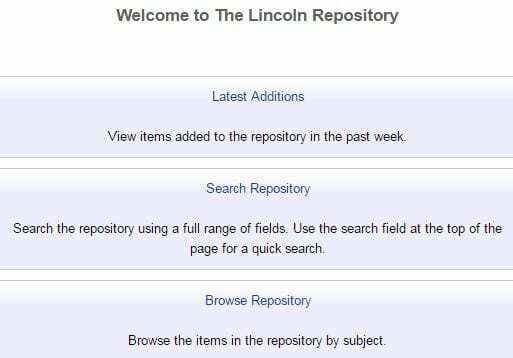 The University of Lincoln’s highly recommended Institutional Repository is our permanent deposit of research outputs which can be browsed or searched through this website or through searching the internet. Wherever possible, repository content is freely available for download and use according to our Copyright and Use Notice. The Lincoln Business School holds some 885 articles (browse by University structure > College of Social Sciences > Lincoln Business School) whose impressive archive stretches back to 1989. Alternatively you can browse by year, subject or creator (via an a-z of surnames). For instance, Geeta Lakshmi currently has 7 articles with more in the pipeline, and Juliana Siwale has 8 articles in the Repository as members of the Business School.